Welcome to the Biomat Shop! Thank you for your interest in the Richway Amethyst Biomat 7000mx. We’re thrilled you found our store and are interested in improving your health and well-being. 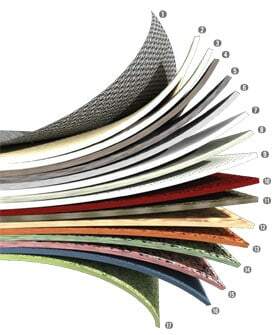 Biomat products are created using cutting-edge technology, advanced engineering and artisan level craftsmanship that will surpass your expectations of quality, performance and design. The Biomat 7000MX is used by millions of people around the world to live healthier, happier lives. We’re sure you will enjoy it as much as they do, and that it will help to ease the symptoms of your health conditions. We even offer a 7-day risk free trial period to back that guarantee up. If you have any other questions please check out our Biomat Shop Resources page, chat with us on our web chat, or contact us at 1-855-324-6628. We’re here to help! You can order online or over the phone. Our phone hours are 7:00 am to 7:00 pm Pacific Time. The Biomat is a medically approved device by the FDA and is used in hospitals and clinics around the world. It’s recommended by doctors and therapists because it’s easy to use and it offers fast and effective relief. Optimize your health whenever you want at home with your own Biomat. 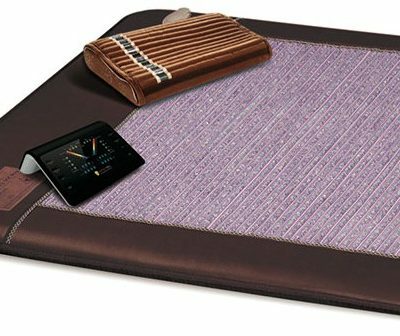 No other infrared mat on the market has FDA medical device approval or the certification levels of the Richway Amethyst Biomat. Your health and safety are the top priorities of Richway and Fuji Bio. Don’t get hurt by an imitation or poor quality infrared mat. 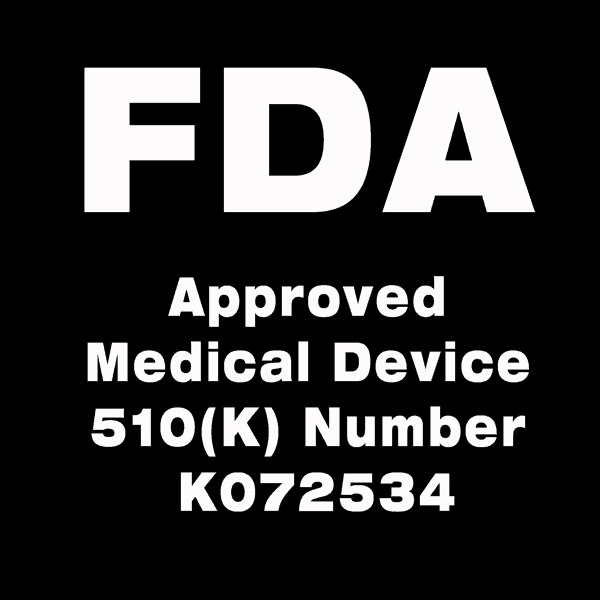 U.S. FDA Medical Device 510K Number : K072534. Medical device certifications are some of the most stringent certifications in the world. No other infrared mat has these certifications. 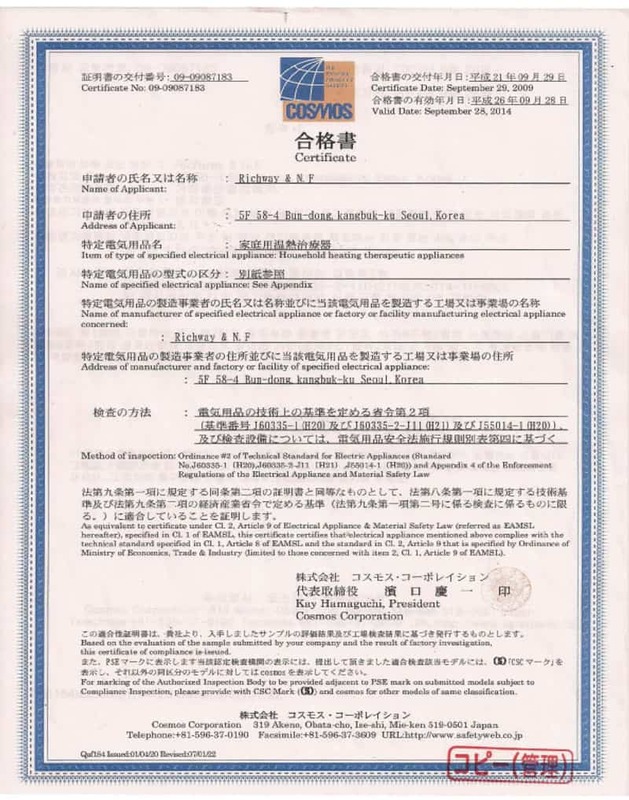 View safety our Safety and Certifications page for more information. The ability of mineral oxides to generate infrared ray waves was discovered by NASA. The Biomat technology harnesses minerals, fabrics and ceramics to convert energy into beneficial infrared ray waves. The Biomat’s advanced technological materials also emit negative ions that energize and refresh the human body. The Amethyst Biomat is a unique innovation in biotechnology. The new Biomat 7000mx controller has an advanced I.C. chip that controls electromagnetic waves, protecting you from the harmful effects of electromagnetic radiation. Unlike an electric blanket, the Richway Biomat does not get hot when it is turned on. When you lie down on the mat, the pad and your body warm as the infrared waves penetrate deep into your body. Far infrared rays penetrate 6 inches and benefit blood vessels, organs, lymph glands and the deepest parts of our body. 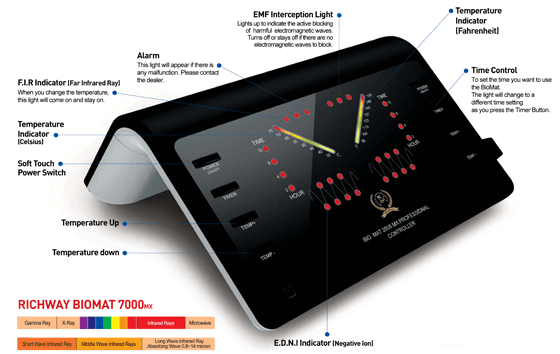 The Biomat 7000MX controller acts as an EMF interceptor that behaves similar to a electric lightning rod. The EMF interceptor safely conducts the negative EMF away from you into ground. This feature blocks your exposure to EMF, offering you and your family protection from these harmful fields. Electric blankets and other infrared devices do not offer the advanced EMF protection of the Amethyst Biomat 7000MX. Don’t risk your health on heating pad or imitation infrared mat. Infrared rays provide a deep penetrating warmth and help to relax tense muscles. The infrared rays in the Amethyst Biomat are the same rays that are found in warming sunshine. The deep warmth of the infrared soothes aching joints and muscles. The Biomat 7000MX can also raise the internal body temperature, helping to stimulate the immune system. Long sessions on the mat can induce a toxin-eliminating sweat. Your overall health, vitality and resistance to disease will be strengthened. The gentle warmth of infrared has been described as deeply nourishing and relaxing, and can soothe stress and knotted muscles. You will feel rejuvenated and renewed, calm in body and mind. The Biomat Professional contains 28 pounds of the highest quality Korean amethyst! Korean amethyst is highly regarded as the best in the world. 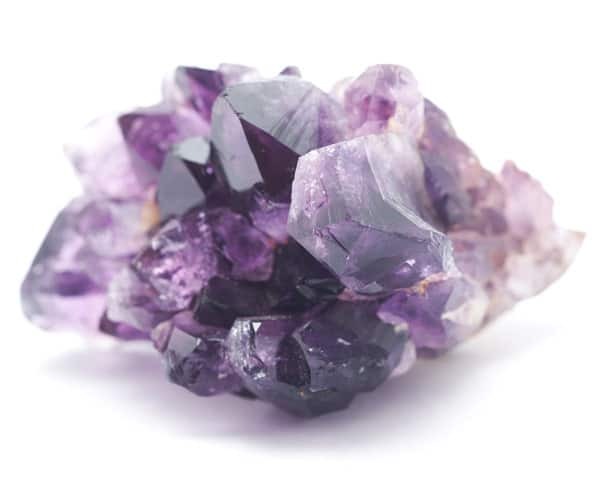 Amethyst crystals produce far infrared rays (FIR). FIR revitalizes the biological functions of cells, helping to promote blood circulation, perspiration, relief from neuralgia, backaches, arthritis and eliminate toxins. Far infrared rays also help to relax and nourish the body, promote antibacterial functions and purify the air. 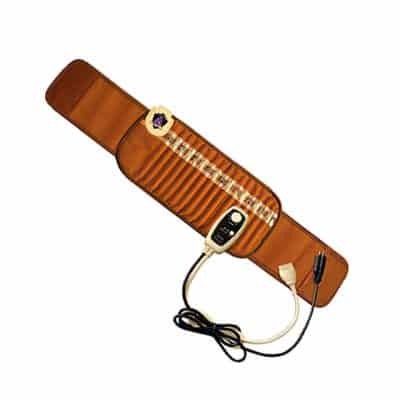 The Biomat generates negative ions. Negative ions are found in abundance in forests and around waterfalls. There is a reason that people enjoy these natural environments! Negative ions produce biochemical reactions in the body that improve feelings of overall well-being. 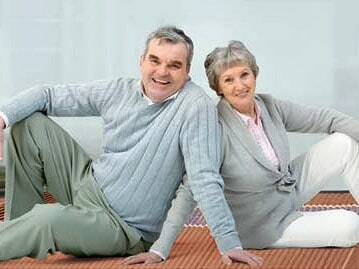 Arthritis relief: Biomat users experience soothing temporary relief of joint pain associated with arthritis. Eases minor joint pain and stiffness: The deep penetrating warmth offers long lasting relief for joint pain and stiffness. Reduced stress and fatigue: Gentle warmth and relaxing negative ions soothe tense muscles and relax stressed minds. The Biomat will leave you feeling rejuvenated and rested, restored in body and mind. Skin vitalization: The Biomat aids skin and cellular detoxification through sweating and improved circulation. Improved circulation improves the body’s ability to nourish the skin. Soothing pain relief: Deep heat soothes aching joints, increases circulation and helps to deliver oxygen-rich blood to oxygen-depleted muscles so they recover faster. Injuries and aching muscles recover much faster with just a short session on the BioMat. Improved circulation: The deep penetrating infrared heat warms the body and forces the heart to work harder pumping blood to boost circulation. Promotes restful sleep: for those with occasional sleeplessness. The pain relief that many Biomat users experiences allows them a better, more restful sleep. Increased tissue oxygen: due to increased circulation where applied. Minor muscular back pain: The soothing heat relaxes muscles and can relieve minor muscular back pain. Supports the immune system: penetrates deep into the body and raises internal body temperatures which act similar to a fever which strengthens your immune system. Elimination of toxins and cellular through sweating improve your overall health and resistance to disease. 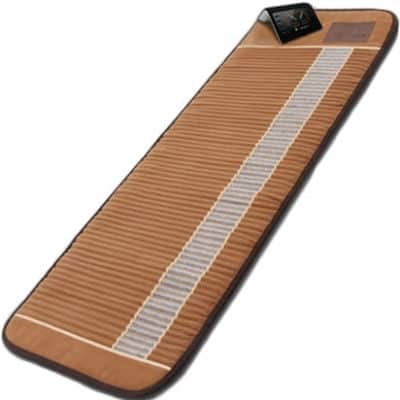 Soothes and relaxes: Regular use of the biomat will help you relax and soothe your body. Normal heating pads do not utilize far infrared technology and therefore do not provide the same type of deep healing benefits that the Biomat offers. Infrared technology will be at the forefront of 21st century healing research due to the healing reactions caused by inducing artificial fevers. The Biomat is a truly innovative healing device! After using a conventional heating pad for 10 minutes, only the outer surface of the skin has been affected. 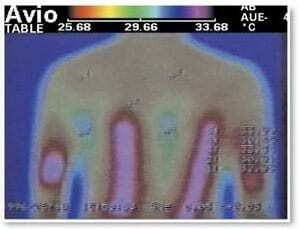 After 5 minutes of using biomat far infrared rays, the far infrared rays have penetrated deeply. Images show poor circulation before and after 14 days of Biomat use. Note the increase in circulation. When the body is warm, metabolism rises, increasing blood circulation. The circulation of the blood can be likened to the work of a fleet of trucks, some that bring in fresh food and others that take away the garbage. The heat from internal organs provides the energy, the heart provides the delivery. What Biomat 7000MX sizes are available? For a complete comparison of sizes and specifications please see our Biomat specifications page. Or view the individual product pages and click on the specifications tab. Click on the image to view product page. Biomat is a medical device for the temporary relief of joint, muscle and arthritis pain. The Quantum Energy Pad is designed for those who find the Biomat uncomfortable to rest on. It adds natural infrared and extra negative ions and requires no electricity. 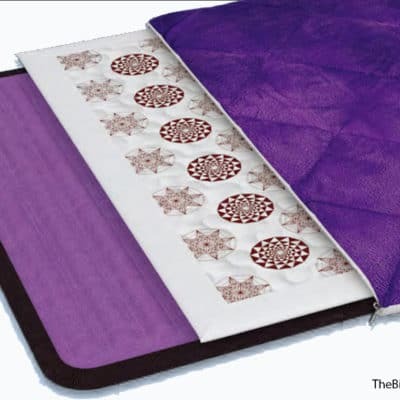 The Orgone Biomat is a bedding product designed to help improve the user’s quality of sleep. 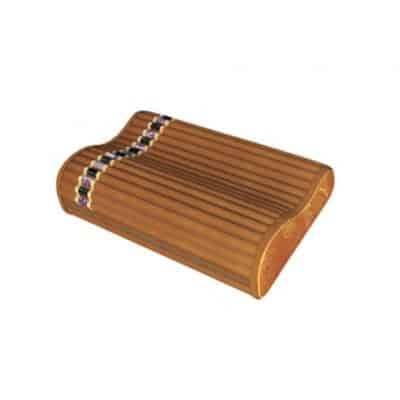 Why does the Biomat Mini have alternating rows of amethyst and tourmaline stones, while the larger sizes only have amethyst stones in the channels? All Biomats have a layer within them called the Tourmaline Catchpower (TOCA) layer. This layer is inside of the mats and not visible in plain sight. 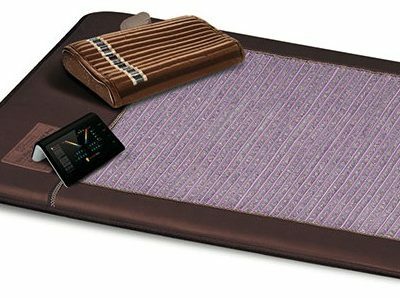 The Biomat Mini does have alternating channels of amethyst and tourmaline crystals to match its output of negative ions with the larger mats. What are the differences between the older Biomat 3000MX and the latest Biomat 7000MX? The Biomat 7000MX is the latest model and contains the Tourmaline Catchpower (TOCA) layer and Peach and Grape Seed Layer for additional far infrared and negative ion output. The 7000MX models also utilize a state of the art, ergonomic controller with added safety features and the latest IC chip. What is the waterproof pad made of? The waterproof pad is 100% polyester with an added proprietary coating. This specialized coating is resistant to water. While it is thinner than our previous model of waterproof pad, this version is much more durable and denser thanks to this proprietary special coating. The waterproof pad repels water while remaining permeable to particles smaller than water. This means that while the waterproof pad is composed of a “synthetic” material, it is designed to allow infrared rays and negative ions from the Biomat to easily pass through it and reach the end user. Your marketing materials says that the Biomat has reduced EMF but the controller still has EMF. Why? EMF emission is reduced from the Biomat itself (mat portion). However, the controller will still emit EMF because it is plugged into an electrical source. All appliances that plug into an electrical source will emit some EMF. The Biomat works in a way in which it does not always require active electricity . When the Biomat is actively heating up to the designated temperature, it is using electricity, which means the controller will emit EMF. Once the Biomat has reached its designated temperature, it stops using electricity, and the EMF emission from the controller will be reduced. 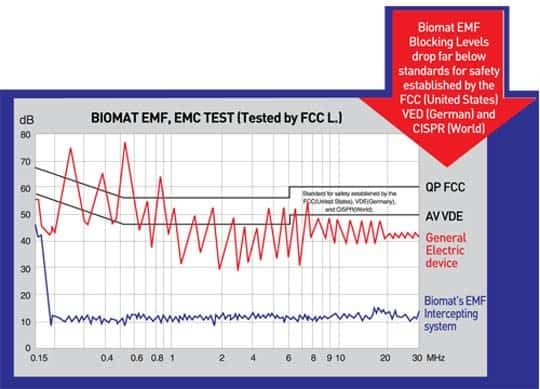 How does the Biomat reduce EMF? All electrical appliances emit some amount of EMF. There are a few innovative layers within the Biomat that help to reduce exposure to EMF from it. The Reverse Currency Heating Layer has built in EMF interception. In addition, we have incorporated a Copper Fabric Layer, Carbon Fabric Layer, and our exclusive Nano Copper Fabric Layer to aid in reducing EMF from the Biomat. The controller of the Biomat also has a function which pulls EMF from the mat to the ground. There are a sequence of lights on the Pro/Single/Queen/King Biomat controller called EDNI. What does this stand for? EDNI stands for Electrically Discharged Negative Ions. The EDNI lights flash when negative ions are being electrically produced. These lights turn on automatically once the Biomat has reached its designated temperature. Does the Biomat have earthing functionality? No, the Biomat does not function as an earthing mat. How does the Biomat produce infrared rays and negative ions? The Biomat uses a combination of fabrics and amethyst stones to generate far infrared rays which are then transferred to the body as heat. 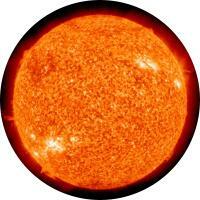 The heat comes from friction generated within the body through the effects of far infrared rays. 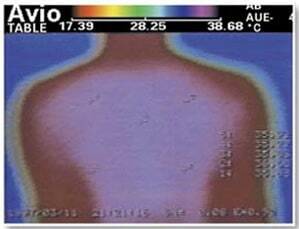 Far infrared rays warm the inside of your body and the part of your body contacting the Biomat. Negative ions are generated electrically and using special components within the Biomat such as the Tourmaline Catchpower (TOCA) Layer. When did Richway release the 7000MX Biomat model? The Biomat® 7000MX line was released around November 2012. Why is amethyst primarily used in the Biomat instead of other gems like some other mats? The Biomat has undergone numerous iterations since its release in 1998. Jade was first used as a primary natural infrared source. Through years of extensive research and data compilation, we have found that no other stone comes close to the output that amethyst offers. While other companies use a mixture of various stones and materials to set themselves apart from Richway and even possibly cut costs, Richway only uses what it has found to be the best materials for the Biomat. In addition to amethyst, all Richway Biomats have a tourmaline layer within them which produces an abundance of negative ions. The Biomat Mini uses black tourmaline gemstones with amethyst which allows it to match the negative ion output of larger mats. Some competitors use tourmaline ceramic beads in their mats. This is a cheaper and less effective alternative to the black tourmaline and black tourmaline fabric used in the Biomat. I heard that synthetic materials cut the effects of the Biomat. Is this true? Synthetic materials reduce negative ions. While the Quantum Energy Pad uses microfiber, we also include an additional Tourmaline Catchpower (TOCA) Layer within it to replenish the negative ions lost. Also, while our waterproof pads are 100% polyester, they are designed to be permeable to molecules smaller than water. Therefore, negative ions and far infrared are easily able to pass through while keeping the Biomat dry. Is the Biomat King/Queen/Single made of real leather? No, the brown, outer material of the Biomat King/Queen/Single is a synthetic material. Is the Biomat a disease treatment and/or prevention tool? 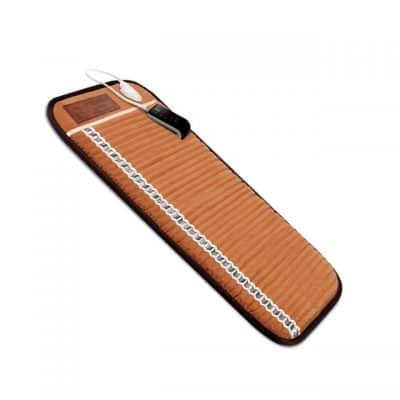 The Biomat is classified as a medical device and is a tool to aid in arthritic pain reduction and the temporary increase of blood circulation. I accidentally fell asleep for a few hours on my Biomat. Am I safe or did I “fry” my internal organs? It is not possible to fry your internal organs while using the Biomat. We do not recommend using the Biomat at higher heat settings for extended periods of time due to the risk of skin burns. What is the quilted cotton pad that came with the Biomat for? Do I need to use it? Yes, the included cotton pad should always be used over the Biomat to evenly disperse the heat and for safety purposes. If the cotton pad or another fabric is not placed directly over the Biomat, the heat may disperse unevenly, and the polyurethane strip of the Biomat will get hot. This is my first time using the Biomat. What temperature should I set it to? If you are new to using the Biomat, we recommend starting at a low temperature (95°F-104°F). You may start to increase the temperature gradually based on your comfort level. Be sure to stay hydrated while using the Biomat! How long can I use the Biomat? When using the Biomat at higher temperatures (104°F and above), we recommend sessions of up to 40 minutes a day. The Biomat may be used at lower temperature settings at any duration of time. Make sure to keep yourself hydrated when using the Biomat, as the infrared heat and sweating may cause dehydration. Do I need to use the waterproof pad? We recommend using the waterproof pad to help protect your Biomat from sweat, spills, and other accidents. For those who use the Biomat in professional practices or for yoga/meditation, we highly recommend using it to keep the Biomat protected and prolong its life during frequent use. In what order should I set up the Biomat with the cotton pad and waterproof pad? Lay the Biomat on a flat surface (floor, bed, or massage table) with the crystal ridges facing up and toward you. Place the Cotton Pad over the Biomat. Lastly, place the Waterproof Pad over the entire setup. If I put additional layers over the Biomat for added cushioning, will it cut the output of far infrared and negative ions? Yes, any additional layers over the Biomat and included cotton pad will cut the output of far infrared rays and negative ions depending on the thickness of the added layers. 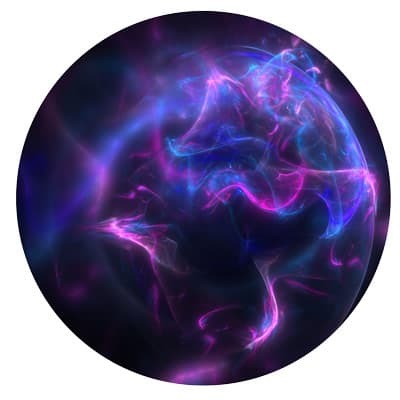 We offer a Quantum Energy Pad (sold separately) for added cushioning. The Quantum Energy Pad is comprised of Bio Clay Memory Foam which was designed to allow the Biomat’s far infrared rays to pass through it easily, a Tourmaline Layer for added negative ions, and a microfiber layer which does not promote the growth of bacteria and dust mites. How long does it take for the Biomat to reach the designated temperature on the controller? The Biomat can take anywhere from 1 ½ to 2 hours to reach its designated temperature. There are several factors that can affect this. It is important to place the cotton pad (included with the Biomat) on top to ensure even heat. The higher the temperature is set, the longer it will take to reach it. Lying on the mat or covering it with a blanket while it is heating up may speed up the heating time. I have a 120V USA Biomat and am travelling to a location that uses 220V power. Can I just purchase a 220V controller to use with my 120V Biomat? No, both the Biomat and its controller are wired specifically for their designated voltage. Interchanging the two types of controllers may result in injury or damage. We recommend speaking with an electronics specialist to purchase a voltage step up/step down transformer which is compatible with the specifications listed on the back of your controller and the tag on the back of the Biomat. Can I interchange different models of controllers with different models of Biomats (i.e. 3000MX controller with 7000MX Biomat)? No, the models of controllers and Biomats should not be interchanged for safety reasons. Is it safe to use massage oils on the Biomat? We recommend against using massage oils while using the Biomat. Biomats damaged by massage oils and other spills are not covered under the warranty. If you still plan to use oils with the Biomat, we highly recommend purchasing a waterproof pad. We carry waterproof pads for the Biomat Mini and Biomat Professional. Oils which seep onto the Biomat may damage and wear the internal components of the product. The waterproof pad assists in protecting your Biomat from liquid damage. May I use the Biomat on a waterbed? No, the Biomat should not be used on a waterbed. May the Biomat be used on a memory foam mattress/topper? The Biomat contains a thermal protection layer near the bottom of it to aid in keeping heat from travelling downward, but some heat may still travel down toward the surface it is laying on. We recommend contacting the manufacturer of the mattress/topper to confirm if heat may damage its components. If so, do not use the Biomat on such a surface. Is there a benefit to using the Biomat without any heat setting? If the Biomat is turned on without a heat setting selected, it will still actively generate beneficial negative ions. Where is the Biomat made? The Biomat is made in South Korea. The PTFE in the Biomat is safe. PTFE is non-toxic and stable at temperatures below 400°F. The Biomat does not heat past 158°F, and this layer is well within the Biomat away from contact. How do I care for my Biomat to ensure it remains in optimal condition? Always use the included cotton pad over the Biomat. We highly recommend purchasing a waterproof pad for the Mini and Pro Biomat sizes (sold separately) as spillage and accidents may occur. Liquids can damage the internals of the Biomat. The waterproof pad is also helpful in protecting the Biomat from perspiration and massage oils. If the Biomat has any moisture or perspiration, use a dry towel to wipe it off. Do not leave any moisture on the Biomat after cleaning the product. We recommend wiping the clear window on the Biomat with a damp, clean cloth once a month to maintain good condition. The included cotton pad should be washed at least once a week. It is machine washable with cold water. Store the Biomat lying flat (not folded) and in a well-ventilated area. If you must fold the Biomat, do so the same way as you received it. Folding it in the opposite direction may cause the internal circuitry to break. I just received my Biomat, and the alarm light/158°F light on the controller is flashing and not operational. What do I do? When the alarm light or 158°F light flashes on the controller, this sometimes indicates that the connection going into the Biomat is not pushed in all the way or secure. Disconnect the Biomat from the power source. Place the Biomat on a solid, flat surface. Reconnect the connector into the Biomat with one hand holding the plastic cap on the mat. Reconnect the power and test the mat. If you are still experiencing issues, please call our customer service center at 1-855-338-6410. My pet had an accident on the Biomat. Is there anything I can do to clean the Biomat and reduce/eliminate the smell? The Biomat is an electrical appliance, therefore, it cannot be submerged in water. We recommend mixing a solution of equal parts white vinegar and water. Submerge a clean cloth into the solution and wring it out so it is not soaking wet. With the damp cloth, dab the surface of the Biomat and repeat this process (always ensure the Biomat is unplugged when doing this). Finally, leave the Biomat in the sun to dry. If possible, while drying in the sun, turn the Biomat on to the highest temperature. 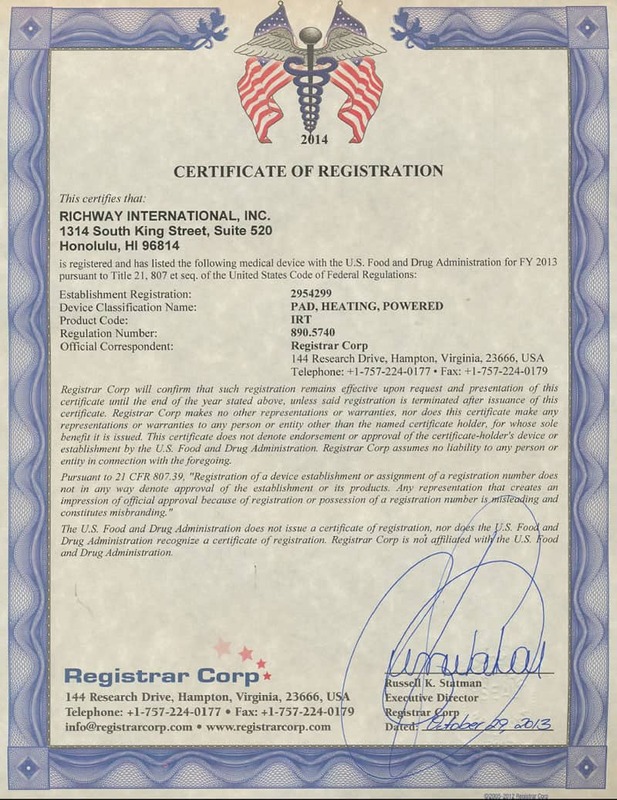 If you would like to return your Biomat, you can get a return merchandise authorization (RMA) from Richway head office by contacting Richway at 808-589-2800 or 1-855-338-6410 (toll-free) or by email at [email protected] You will need your Richway Invoice number from your order, which should be in your email and with the paperwork included in your order. If you do not have your RI number and you purchased from our store, please email us at [email protected] and we will provide you with the RI number. If you purchased from another independent sales associate you will need to contact them directly or contact Richway. Richway uses a graduated return system so please contact Richway as soon you decide you would like a refund to maximize your refund. Returns must be received by Richway within two weeks after obtaining an RMA number. You can download Richway’s return policy here. I have been suffering from chronic neck and back pain for over 3 years, after being involved in an accident with a semi. I went through 10 months of physical therapy, 3 MRI’s, 4 EMG tests, 36 spinal injections, a trip to the emergency, and countless prescriptions for pain and nothing seemed to be working. I was becoming desperate and depressed until I was introduced to the Biomat. After only 2 months of using the Biomat I can now say that I am pain free. It is the only thing that has helped me not only with my pain, but with my attitude as well. I love my Biomat. Renee M.
I learned about the Biomat from Marilyn my massage therapist. I’ve been seeing her for my back and neck pain and my general difficulty sleeping due to pain and stress. On a treatment visit I discovered something different about her massage. I asked her what was different and she mention she was now treating her patients on the Biomat. I asked her all about it and she offered a demo for a week. After one week I was able to sleep all through the night. I also noted a sharp reduction in pain. I purchased the Biomat right away. After six months I’m sleeping deeply throughout the night and my neck feels better. Before the Biomat I couldn’t look straight up at the ceiling from a standing position. Now, I can look straight up, pain free.